Batteries made of the metal vanadium have the potential to transform electrical grids and our ability to make use of green energy such as wind and solar power, CBC's David Common reports. New York has a reputation as the city that never sleeps. But it does use much less electricity after dark — and its utilities charge a lower price for power then. On top of a Manhattan skyscraper is a battery as big as a car that charges itself at night, when most of the building is empty and electricity costs less. When office workers arrive the next morning — and the electricity price rises — the battery discharges to power the building. The mega-battery was made by the German firm Gildemeister in partnership with American Vanadium (don't let the name fool you, it's actually Canadian, run out of Vancouver). American Vanadium supplies the vanadium that powers the battery. The new battery technology has the potential to transform electrical grids, along with our ability to make use of green energy such as wind and solar power. The metal vanadium is element 23 on the periodic table, between titanium and chromium. American Vanadium owns the world's largest known deposit of vanadium, at a mine in Nevada. Bill Radvak, the company's president and CEO,is looking for ways to exploit the resource. Vanadium has long been used to strengthen steel — just a tiny amount can make steel 10 times stronger, allowing thinner beams to be used to building construction. But recently, there has been lots of interest in using it to make batteries. 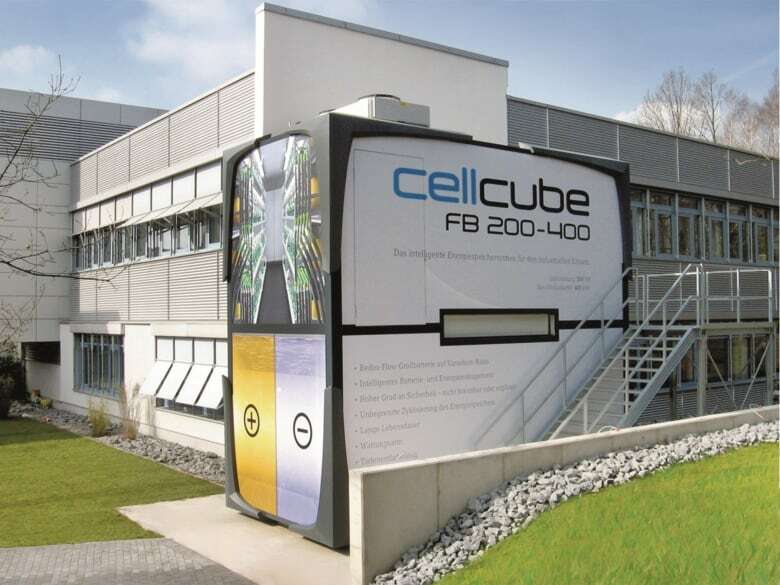 Vanadium is a unique battery material because it's the only element that can be used on both sides (positive and negative) of the same battery, Radvak said. When there are different elements on the two sides of the battery, as in a lithium battery, the electrodes degrade with every charge, he added. "But when you actually have the same element on both sides, the battery lasts essentially forever." According to Radvak, vanadium batteries can be used for more than just saving money on bills by buying and storing electricity when it's cheap for use when electricity is more expensive. "It's part of the way of changing the way energy is distributed." Consider that grids are built for the the highest demand days — often in the summer when air conditioners are at full blast. In Canada, there are usually only a handful of maximum load days on the calendar. Still, electrical utilities must have distribution lines to carry that load year-round. If vanadium batteries could provide the boost on days when it's needed, utilities wouldn't need as much carrying capacity. They could invest less in distribution systems without risking a brownout. The United States, particularly in the desert south, has embraced vast solar fields and wind farms. But you can't control when it's windy — and sometimes you need power more at night than when the sun is out. So how do you store the power generated for when you need it? Vanadium can hold large amounts for long periods, without decaying the battery itself. This idea alone has utilities worldwide fascinated by the possibilities. But it's not yet the great solution. That Nevada mine is not yet being exploited on a mass commercial level. Likewise, the technology is not fully proven. It has only been used on a small scale and more research and development work needs to be done before it can reach the point of mass commercialization. But if it works and is cost effective, vanadium could have a transformative effect on power generation, storage and consumption.